Standing in this corner at 65 years old, 6’2 businessman. It’s Mitt Romney! He saved the Winter Olympics now he wants to save America. His opponent standing in at 6’1, This 51 year old has been President for the last four years. Lean and hungry for a second term, It’s Barack Obama! Both candidates were poised for their Election Day main event. The winner will receive a key to the White House, Secret Service protection for the rest of their life and responsibility of the free world for the next four years.They will also be facing an exorbitant amount of problems facing our great country. There is tension in the Middle East, a divided Congress, and a slew of budget cuts, and tax increases that could cripple the economy. But there is one problem that if not fixed could be even more damaging than any of the problems listed above, I’m talking about campaign finance. Recently there has been a jump in campaign spending. According to Opensecrets.org $680,149,876 dollars was added to this years election spending. Why the rise in spending? Well Super PACs are responsible for the almost $700,00,000 added to this year. Super PACs have only existed since 2010 and have already had a huge effect on campaigns. In 2008, a conservative interest group, Citizens United, released a movie titled Hillary. The movie was based on then Democratic presidential candidate Hillary R. Clinton. They aimed to release the movie about a month before the New Hampshire Primary. However, due to the McCain Feingold Act “Bipartisan Campaign Reform Act of 2002(BCRA), federal law prohibits corporations and unions from using their general treasury funds to make independent expenditures for speech that is an “electioneering communication” or for speech that expressly advocates the election or defeat of a candidate. An electioneering communication is “any broadcast, cable, or satellite communication” that “refers to a clearly identified candidate for Federal office” and is made within 30 days of a primary election.” Citizens United took their case to the Supreme Court. The court found in their ruling that “The Court has recognized that the First Amendment applies to corporations.” That means corporations could now spend however much they wanted to on campaigns. Consequently, In the last decade or so campaigns have been notably more affluent. To facilitate for the rise in campaign spending the Supreme Court also created Super PACs. PAC stands for political action committee. PACs are candidate committees that raise money for the candidate they support. However, the money they can raise is limited, and they have very strict rules in how they can spend their money. Super PACs are PACs in the sense that they can raise money but there are a few key differences. Where PACs are limited to the amount of money they can raise, Super PACs can raise unlimited funds. PACs can donate their money directly to a candidate or a candidate’s campaign, Super PACs are not allowed to have any coordination with a candidate or campaign. This video below from CBS news reports on Super PACs . The report goes into detail about how Super PACs are changing the political dynamic of America. The report states “(Super PACs) are helping make 2012 the most expensive election ever.” This video here describes how Super PACs work, what they are, and how they are and how candidates are using them. The video tells us that coordination between Super PACs and candidates(which is illegal) is very hard to pinpoint and is pretty prevalent among the Republican candidates for president. The race for the GOP nomination was almost as extensive as the actual presidential election. It took until May for the GOP to find a presumptive nominee. 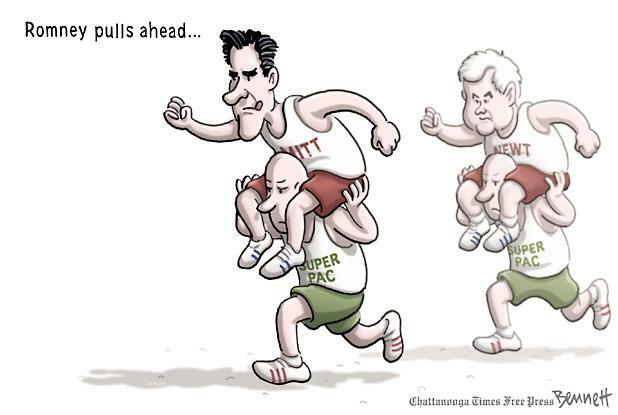 Eventually, Mitt Romney did win the nomination, with the help of Super PACs. When Romney said corporations were people he was signing off on the Supreme Court’s ruling in Citizens United v. FEC in which Super PACs were created in the court’s opinion. He indirectly supported Super PACs but he did not deny that he did not support them. The Supreme Court did rule that the First Amendment does apply to corporations, thus making them people. Although Romney did not come out and say he was all for Super PACs, he did endorse the Supreme Court’s decision. The president on the other hand has been pretty quiet about Super PACs. He originally opposed Super PACs, but recently he has “flip-flopped” on the issue. According to a CBS News article The Obama campaign manager Jim Messina said in an email to supporters Monday that the president’s campaign “can’t allow for two sets of rules” in which the Republican presidential nominee benefits from “unlimited spending and Democrats unilaterally disarm.” The president’s campaign ultimately saw Super PACs as a threat to his reelection so he had no other choice to accept the millions of new dollars that wasn’t there before. Obama became dependent on the money from that point on. The president originally saw Super PACs as dangerous but he did “flip-flop” on the issue. Something he hammered Mr. Romney for during the election process. Even thought the president first did not support Super PACs he realized the disadvantage of not using them. Could you say no to hundreds of millions of dollars? Besides the presidential election, the Senate and House of Representatives also held elections. In Connecticut there was a very close Senate race in 2012. Linda McMahon former World Wrestling Entertainment CEO “spent close to $100,000,000.” Writes Matthew DeLuca of the Daily Beast. However McMahon has spent that $100 ,000,000 of her personal money on two failed senatorial campaigns. With the money she spent on the election this year and the amount of votes she got in Connecticut she spent $106.60 per vote. She was only able to win 45% of the vote in her state. Even with an added $100,000,000 dollars to her campaign on top of what she had fund-raised already. In the case of Connecticut money did not decide the election. Let’s take the state of Ohio for example for campaign spending. The state of Ohio casted 5,291,039 votes for president this cycle, according to Politico. Of those votes 2,697,260 were for President Obama, while Governor Romney received 2,593,779 votes. A total of $19,429,118 was spent in Ohio this year according to the Federal Election Commission. Mitt Romney’s campaign spent $10,374,934 in Ohio, meaning that Romney spent $3.99 per vote. Obama put $7,174,141 into Ohio, he spent $2.65 per vote in Ohio. President Obama carried Ohio and as the old adage says As Ohio goes, so goes the nation. Perhaps the president won because of his incumbency status or the way he handled the auto bailout. With the evidence given we can conclude that the state of Ohio was not won by money. The almighty dollar did not pull through. And the winner by majority decision, and the next president of the United States Barack Obama! Both men had a good fight. With big money on both of their sides this election was seeming to be close. In the end our president secured his victory, the democratic process secured a victory, but big money lost the fight. I'm a student at James Madison University. New Jerseyan. Politics junkie.